April is National Poetry Month. Naturally, as a literary publisher that puts out at least a few poetry collections per year, we’re pretty stoked about it. This year, in celebration, PQL’s publisher, Tim Inkster, recalls the humble beginnings of one of the cornerstones of our poetry list: the Essential Poets series. 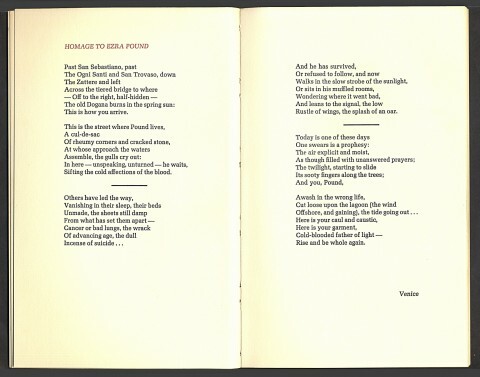 The Venice Notebook by Charles Wright is a slight (40 page) early collection of poems published in an edition of 500 copies by Barn Dream Press in Boston in 1971. I was given a copy, which I still cherish, by my graduating-year CanLit prof at the University of Toronto, the legendary David Godfrey. I was mightily impressed. The Venice Notebook is printed letterpress, in two colours throughout, on an eighty pound laid text stock, sewn into signatures and bound with gaily coloured endleaves laminated to stiff paper wraps. In 1971 I was twenty-two years old. 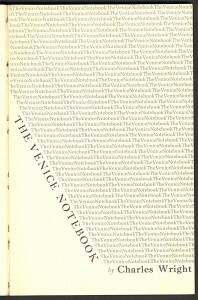 Today, at a distance of 45 years, I can see there are aspects of The Venice Notebook that could have been handled differently, perhaps better, though at the time I felt the production achieved a standard that Canadian publishers should attempt to match. I remember telling Godfrey just that; I am not certain he was convinced. Dave Godfrey had met Charles Wright at the University of Iowa Writers’ Workshop in the late 1950s. Some years later, after Godfrey returned to Canada and founded the House of Anansi (1967) with Dennis Lee, Charles Wright’s The Dream Animal was one of the first titles to appear from the new, ostensibly nationalist publishing house. By 1970 Godfrey had already moved on to partner with Jim Bacque and Roy MacSkimming at so-called new press, which co-published Charles Wright’s The Grave of the Right Hand with Wesleyan University Press, which could well explain why Godfrey would have been favoured with multiple copies of The Venice Notebook that he made available to erstwhile students. I started work for Dave Godfrey as the Multi 1250 operator at Press Porcépic in 1972. One of the early job printing commissions we received was from an American poet from New England by the name of Paul Smyth. I can’t recall how Paul Smyth would have known about Press Porcépic, or how he persuaded himself that we could be trusted with the design and production of his book, but we did make a better than decent job of it. The type is Goudy, set by hand from monotype cases by Mike MacDonald, proofed on a Vandercook that James Reaney had used for Alphabet magazine, then photographed and printed offset on the Multi 1250 in two colours throughout. 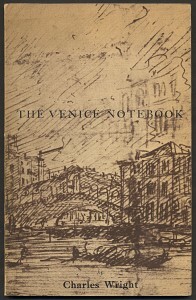 Shadowed Leaves appeared in 1973, based very much on the model of The Venice Notebook, including little touches such as the use of ornate asterisks as section dividers. Unlikely though it may seem in retrospect, Shadowed Leaves was juried for inclusion in the 1974 Design Canada / Look of Books exhibition orchestrated by Allan Fleming and Laurie Lewis. 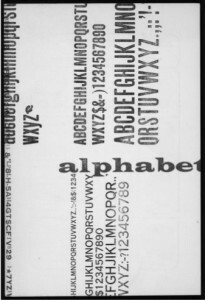 The jury included the German typographer Hermann Zapf. The catalogue makes note of my pressmanship, which was deemed to be creditable. Elke and I started the Porcupine’s Quill in 1974, when it became clear that Dave Godfrey was not much inclined to acquire several tons of antiquated printing and bindery equipment. Many of the early Porcupine’s Quill releases were poetry collections that were not much more substantial than The Venice Notebook, but they were printed offset, not letterpress, and they were most certainly not typeset from monotype in cases. Some years passed. 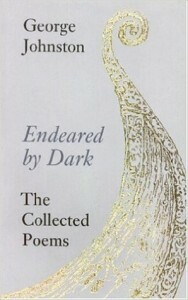 Endeared by Dark was a 328 page Collected Poems of George Johnston that we published in 1990, at the instigation of John Metcalf, as I recall. George Johnston died in 2004, at which time we had not many copies of Endeared by Dark left in print. The thought occurred that the Porcupine’s Quill did not want to shoulder the expense of reprinting a 328 page Collected Poems for the benefit of what we expected would be a slender audience, but we also recognized that we did not, particularly, want to abandon our share of the potential for anthology rights sales to some of George Johnston’s more popular verses. It was at that moment in 2004 that the idea for the Essential Poets series began to take shape. We were fortunate to be able to enlist the support of Robyn Sarah who agreed to edit Endeared by Dark down to an even four signatures (64 pages) that I could print in a day on the Heidelberg KORD. 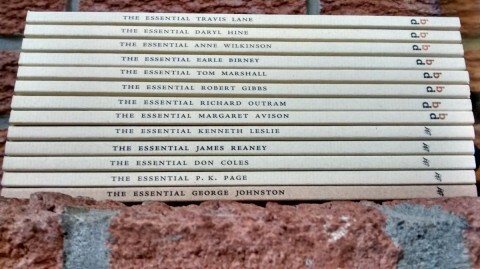 The Essential George Johnston was a first attempt. I wasn’t happy, in retrospect, with the colour of the cover stock, nor was I enamoured with the choice of cover image, but those tentative missteps were quickly sorted by the time The Essential P. K. Page appeared in 2008. 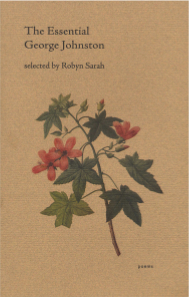 The idea was that the Essential Poets series would draw on the talents of a number of different editors, each of whom would be prepared to ‘champion’ their choice of poet to include in the series. The series would also provide an inexpensive introduction to the work of each of the poets deemed worthy by their respective editors, and the series would be produced to the standards that had beckoned me in 1971 when Dave Godfrey gave me a copy of The Venice Notebook. 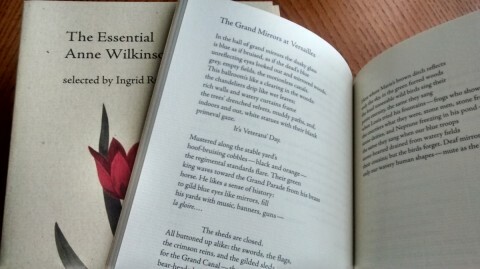 The Essential Poets series is printed on the Heidelberg KORD at the shop on the Main Street of Erin Village in Wellington County. Each title is 64 pages (four signatures), baumfolded and smyth sewn, then bound into paper wraps with hand-tipped decorative endpapers. The type is Adobe Jenson, based on a text face cut by Nicolas Jenson in Venice around 1470, and its italics are based on those created by Vicentino degli Arrighi fifty years later. The cover images are after stipple engravings by Pierre-Joseph Redouté that first appeared in Les liliacées, Paris, 1805. As a publisher I have suffered complaints from any number of editors who would insist that 64 pages is inadequate for a serious appreciation of a poet’s work. This may be true, but I do not see the Essential Poets series as primarily academic, though I am often encouraged when visionaries such as Jeffery Donaldson put titles from the series on required reading lists in first year courses at universities with large enrollments. I used to write poetry, of a sort, myself, at one time. I was never particularly adept, though Ralph Gustafson did include one of my poems in the Penguin Book of Canadian Verse (1975). I stopped attempting to write poetry shortly thereafter when I was asked to design and print the selected poems of John Montague for Barry Callaghan‘s Exile Editions, and simultaneous editions for Wake Forest in the US, Oxford in the UK and Dolmen in Ireland. This was, of course, about as prestigious a book printing contract as could possibly be imagined by a little shop in Erin Village, in Wellington County. We made a pretty decent job of it, for Barry and for John Montague, and I realized, then, that I was not really a poet, I was a printer. This will, of course, be viewed as blasphemy in some quarters, but I must insist that the Essential Poets series was my idea. I am a printer, and to my mind the book arts have an important role to play in the presentation, the appreciation and the preservation of poetry and that’s what we try to do with the Essential Poets series, typeset in Jenson, printed offset on Zephyr Antique Laid, smyth sewn into signatures and bound with hand-tipped endpapers into paper wraps featuring stipple engravings from the nineteenth century. Postscript. In 2014 the Library of Congress named Charles Wright as Poet Laureate of the United States. Dave Godfrey passed away the following year after a brief struggle with cancer. This entry was posted in Letters from the Porcupette (the Intern's Blog) and tagged Charles Wright, essential poets, Essential Poets Series, poetry, The Venice Notebook, tim inkster. Bookmark the permalink.